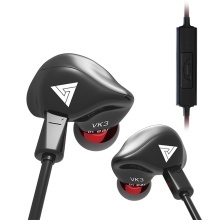 QKZ VK3 wired earphones with metal appearance is fashionable. It is suitable for almost all audio devices with 3.5mm port. In-ear design with soft earmuffs, comfortable to wear and not easy to fall. Also, in-line microphone and control button provide easy operation. Adopts 10mm dynamic circle unit. The sound field width is extended to improve bass strength and quality. Multi-layer graphene vibrating diaphragm greatly restores the sound quality and causes less distortion. One button in-line control with Microphone is for hands-free answering and ending calls while doing other things. Universal 3.5mm gold-plated plug, suitable for smart phone, Tablet PC, MP3 and other 3.5mm audio devices. The cavity structure is designed as per the shape of normal human auricle, provinding wearing comfort and noise isolation.